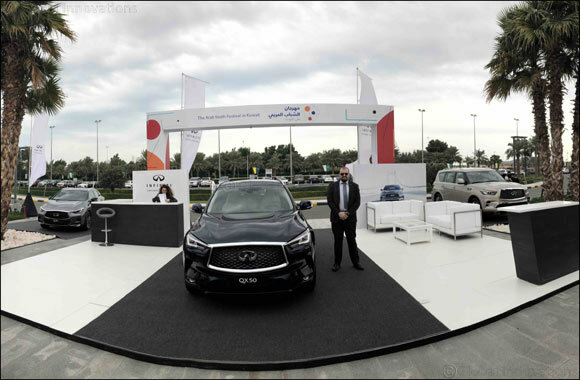 KUWAIT- 7 January 2019: Abdulmohsen Abdulaziz Al Babtain Co. (AABC), the authorized dealer for Infiniti vehicles in the State of Kuwait recently demonstrated the unique features that accompany its new premium INFINITI range, the QX50, QX80 and Q30. Visitors engaged and experienced the models high quality performance blended with aesthetic world class interiors at one of Kuwait’s famous lifestyle destinations, Al Murouj. The new INFINITI QX50 is the world’s first variable compression ratio engine in a production vehicle which was created to fully meet the needs of today’s premium car buyers and to deliver on their desire to own the latest masterpiece of technology. The VC-Turbo engine delivers the strong and convincing performance of a V6 and the fuel economy of a 4-cylinder engine – transforming on demand and based on the input of the drivers. Instantly adapting to their needs, the VC-Turbo lets them harness the exhilarating performance of 268 hp and 380 nm at 4,400 rpm of torque. The QX50 appeals to buyers who require the unique combination of interior space, power, efficiency, hand-crafted quality, and modern design, along with effortless on-road performance. Exemplifying INFINITI’s presence in the luxury SUV segment, the INFINITI QX80 takes INFINITI’s ‘Powerful Elegance’ design language in a bold new direction and come with a taut yet comfort-oriented suspension, and ample performance from its 5.6-liter V8 engine. The flagship SUV model has been created to meet the needs of today’s luxury car buyers, and introduces a more modern interpretation of upscale luxury to the full-size SUV segment. It will appeal to a buyer that wants for nothing: affluent, high-achieving entrepreneurs and business leaders, often with families, who demand space and utility, hand-crafted quality and modern design, and effortless on-road performance. The QX80 has a refined and spacious cabin that features high-quality materials, a hand-crafted finish and advanced drive-assist technologies. The Q30 which is Infiniti’s signature design is a premium compact vehicle that is popular among the younger drivers. Q30 comes with a double-arch grille with a unique 3D mesh and is powered by 1.6L or 2.0L Turbo engines in a 2WD configuration. For enthusiasts, the 2.0L Turbo is also offered with an optional AWD drivetrain. The 2.0L Turbo engine is a power-horse as it delivers 208hp and 350Nm torque. At peak performance, the INFINITI Q30 blasts from 0-to-100kph in 7.3 seconds. Infiniti Al Babtain encourages its customers to continue exploring the advantages of its best in class models in Kuwait by visiting the designated showroom located in Al Rai.